Make every occasion complete with the craftsmanship of this magnificent Tea Scroll. Buy this tea gift box created to offer a complete sense of royal indulgence, made from luxurious Rustic Veneer Wood. Inside are three perfectly placed Tea Tin Caddies holding 3 exquisite flavours of tea. 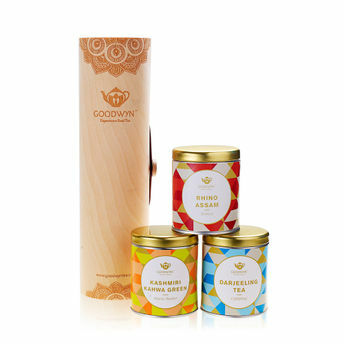 There's no reason to think any further to buy a tea gift since, Goodwyn Tea Scroll is your perfect gifting option. Flavours included are Rhino Assam Tea, Darjeeling Tea and Kashmiri kahwa.